On 11th January we initiated a nationwide broadband survey to find out India’s best broadband service provider (ISP). We are thankful for the overwhelming response from you all. As notified during the closure of the survey we are publishing the analytical report today. 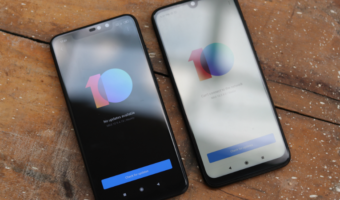 As the entire report would be lengthy when wired and wireless segments are combined, we chose to publish wired segment’s results first. In total we received nearly 2000 responses out of which nearly 10% of the entries were spam. As the spam entries came from one single broadband operator (You Broadband) we could filter it out fairly easily! Read on to find out how we identified spam entries. We chose to consider ISPs which received at least 50 entries for naming them. This criteria was met by only Airtel, Beam Fiber, BSNL Broadband and MTNL. Rest of the ISPs were categorized as ‘Others’. There were nearly 50 such ISPs. With this we chose not to over emphasize on brands but to analyze other aspects which came out of the survey. Nearly 5% participants declared that they have been with the same ISP for over 10 years. Leading the race here was BSNL Broadband. The natural reason here would be the nationwide coverage and 10 years ago major market share on landlines was held by BSNL. 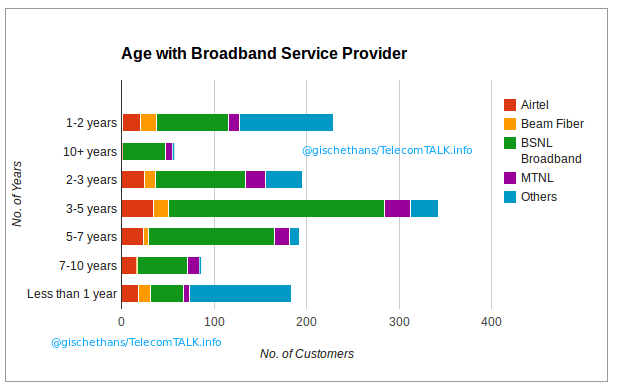 Nearly 30% participants who use ‘Others’ as their ISP have completed 0 – 2 years with the provider. 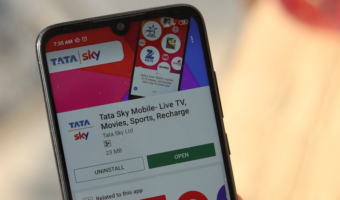 This can be attributed to the fact that India (particularly tier-II and tier-III cities) has seen a sharp rise in private players providing broadband services. 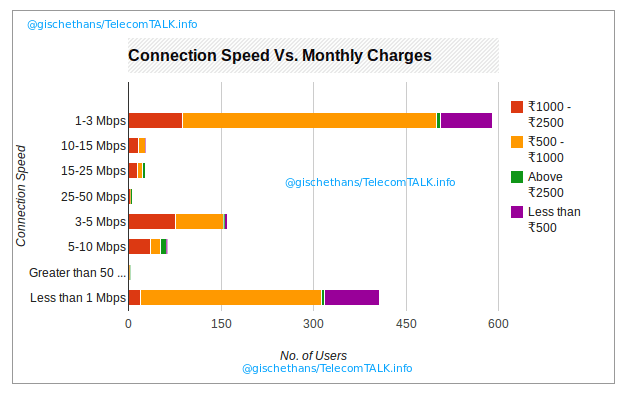 Less than 2% of users use less than 1 GB data per month. This is a clear indication that data consumption is ever growing! Another 40% users said they use internet for video streaming. This must be a good news for Google, Vimeo and others. Another significant usage turned out to be ‘work from home’ – 20% users reported that they work from home! So reliable connectivity has given rise to a new segment of people. The FUP limit ranged from 0.5 GB to No FUP (18%) at all. MTNL is the prominent operator who do not impose a FUP limit on customers. A major chunk of 36% participants responded that their post FUP speed is <=512 kbps followed by 26% with post FUP speed of 512 kbps – 1 Mbps. Wired broadband in India is certainly reliable as less than 20% users face downtime of more than 5 times per month. Nearly 40% of users do not face any downtime at all! For all these headings responses were more or less the same, except for social media support. 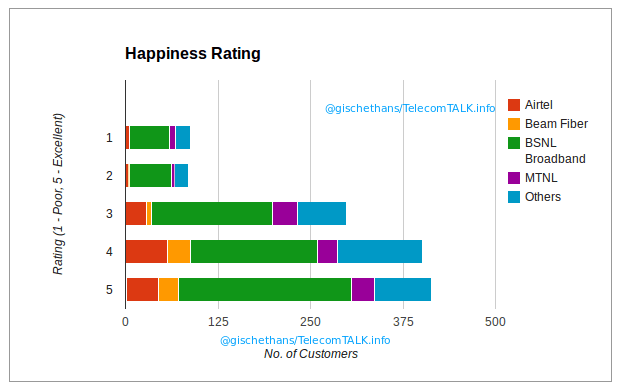 In a scale of 1 (Poor) to 5 (Excellent), all operators got ratings in equal percentage (~20% each). In the case of social media support, nearly 40% participants rated their ISP’s support as ‘Poor’. Why was You Broadband Eliminated? 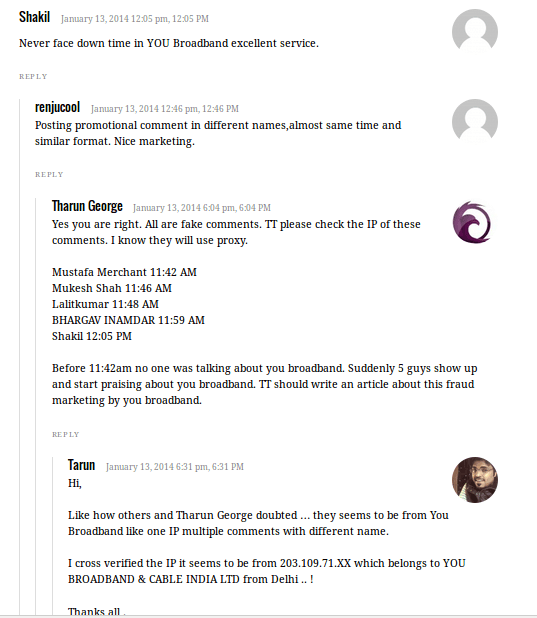 Earlier last week when the survey was in progress, our alert readers alerted us on spam comments about You Broadband. When we checked our CMS for originating IP addresses, we discovered that the suspicion was right. On checking the timestamps of survey entries, nearly 10% of the entries for You Broadband had come at the same time. As we believe in fair practice, we decided to eliminate all the entries in the name of You Broadband. We want this to be a warning to anyone who tries to spam surveys. We believe this survey can play a role in choosing your next or new broadband service provider. It must be noted that in a past long term perspective, BSNL did not have a real competitor all over India. This could be a prime reason for BSNL emerging as a winner. Disclaimer: Note that the above survey was taken by readers of this site, and there are lot more broadband users in this country. The views of people outside our readership might be different. 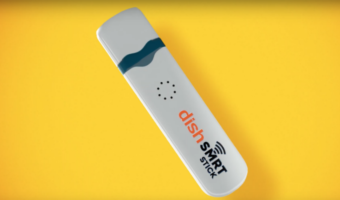 Survey results of Wireless segment would be published later this week. You broadband is cheat like no other! Guys NEVER go for You BB! They will lie, cheat and be happy about it!